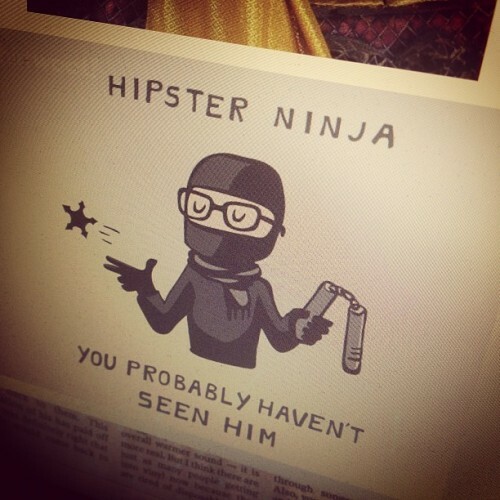 You probably know a hipster. A guy or girl too cool for a lot of things. It is very likely to you to pass by a considerable quantity of hipsters when you walk around, go to work or party at night. But you are not a hipster. They are. I must confess that with my heavy metal / punk / grunge background I always found these skinny jeans, fake eyeglasses, bright sneakers and keffiyeh users an awful subculture. Those mustaches, foldable bikes and pretentious taste for ANYTHING, like cupcakes for example… CUPCAKES. We ended up in a time when there is gourmet cupcakes! What is this “hipster thing” all about? AdBusters’ journalist Douglas Haddow wrote an article in 2008 called “Hipster: The Dead End of Western Civilization” where he describes his research into the hipster world. A participative careful observation I could say, trying to discover how the hipsters’ interactions work. adopt previous movements music and aesthetic references, but not necessarily concerned with the values / philosophy that those movements defended. are the first, so to speak, cultural movement born under marketeers and coolhunters microscope, meaning that as soon as they almost create something barely new, the industry is already there to stole it and sell it back to them. The phenomenon of how industry does that is described at the book “Rebel Sell” PBS’s Frontline “Merchants of Cool”, both very good and critique. don’t call themselves hipsters, probably because having no labels is a very important characteristic, hence anyone who calls himself a hipster is automatically detected as non hipster in a Bourdieu-like way. have no flag or shared philosophy. Take this self proclaimed hipster Steve Aoki discourse. Douglas Haddow defends that these youngsters are “the dead end of western civilization” 1-because of their shallowness and 2- because they are simply not capable of creative thinking, they are not creating anything new, there is no shared values and no flags to defend. I used to think that way, even having some doubts. Now I see it in other way. After a graduation in design, more than 5 years attending to design events in Brazil (you probably have a clue about how many hipsters study design, right) and 2.5 years living in São Paulo next to Augusta Street (probably the most hipster street in town), I think I can put a new idea on the table. I think previous movements and the hipster phenomenon are, in both cases, covering a phase of life called “adolescence”, but now the Peter Pan generation, with protective parents and the weak economy to keep these younglings home with mommy and daddy, ends to extend their adolescence to almost their 30’s. So different from punks who used to let the mohawk go on their early 20’s to find a job and raise kids, today’s young people keep the fun of adolescence for more time (counting on an look that makes them somehow employable). Which in my opinion makes a lot of sense, considering that with modern medicine these people will probably live until 120 years of age. Hipsters are the first generation to be on marketeers’ spotlight this hard and consume power at the same time. They are also the first “movement” born under the information tsunami the internet brought us, having easily access to information, references, everything! Previous generations had few information and time to decide what they should stand for, what probably drove them to embrace some values and movements without thinking too much. The hipsters, on the other hand, have plenty of time and an ocean of information and references to choose from (but ending up with the same mustaches and keffiyeh, anyway…). For me it looks like the whole hipster phase of a person might be a brainstorm of cultural reference and new stuff (considering “new” anything that is new FOR HIM, not necessarily new in general), in this way I feel that after the phase, on their equivalent of shaving the mohawk, they ended up with a better clearance of the differences of the world because they have experienced all that. Older fellas like Douglas expect more creativity from them and do not understand that hipsters were just collecting information, and when they start creative projects it can end up with awesome things. For example, we 80’s kids know how painful is to use an analogical camera, and we love the digital version because of it’s obvious advantages. These new kids, on the other hand, have no idea about how it was, so they prefer to experiment with it (hello Lomo), and after that they can use the “good side” of it (aesthetic effects) with the mobile phone convenience, and there you have instagram. How iPhone 5 should be to address Hipsters needs. The point is: it might be good to have this “identityless” long teenage phase of experiments, if when they come out of it they are more prepared to deal with our modern multi-faceted world. PS:. Thanks to @Cuducos for the comments and references.